The Honda XL600R is one of those bulletproof dual-purpose bikes that will go on forever if looked after properly. It’s simple and strong, and in the right hands, a formidable trail weapon. At around 325 pounds wet (147 kilos) it’s also much lighter than most modern ADV bikes. Which makes it nimble enough for city use—and easier to forgive the hassle of kick-starting a 600cc four-stroke. The XL600R’s looks are something of an acquired taste these days, with a short tank that’s stumpy to the point of almost being triangular. 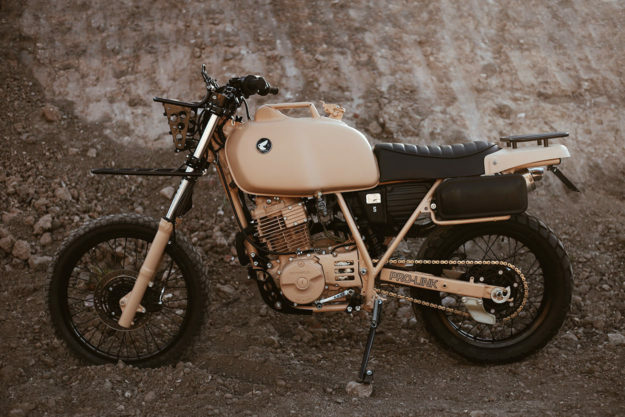 But the simplicity of the big XL makes it the perfect base for a go-anywhere custom. 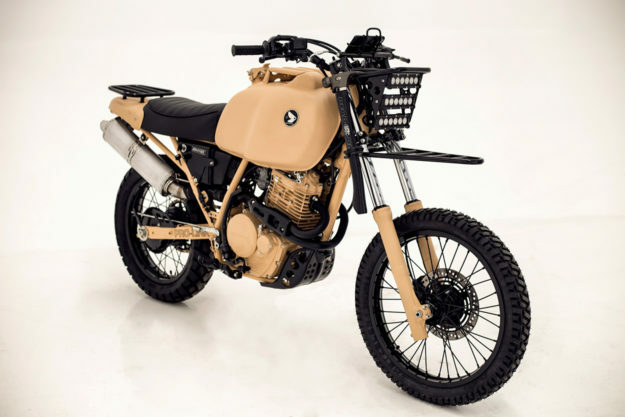 Especially if you want something a little sturdier than a modern-day scrambler. 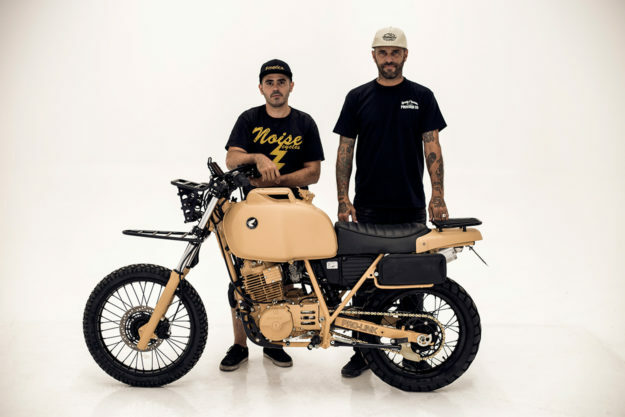 Federico Lozada and German Karp run the motorcycle side of the business, and have made a name for themselves with street trackers. The engine and suspension were in excellent shape, despite the XL being 32 years old. So the guys just slipped on a Ducati muffler to free up the breathing a little. 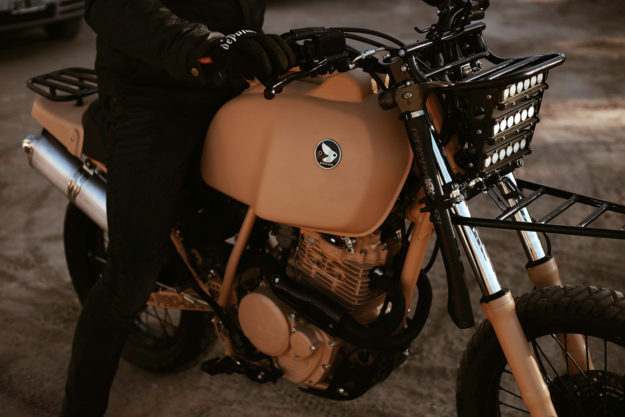 One of the first creative ideas was to build a new tank, to completely change the look of the XL600 and create the ‘trooper’ vibe. 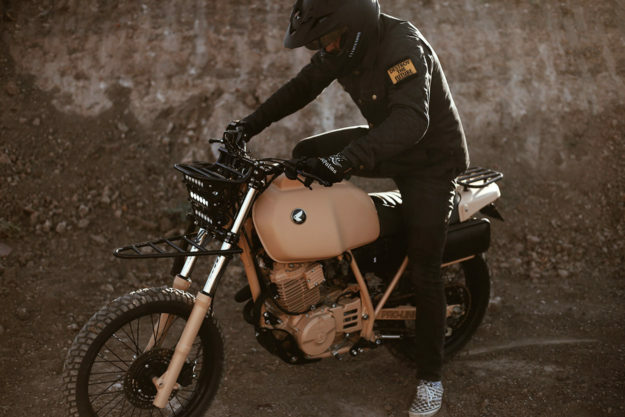 So Fede and German took a BMW R100 tank, and merged it with a traditional metal fuel canister. It’s an approach we’re fairly sure has never been taken before. Rather than modify the XL600R’s existing frame, HMC grafted on the complete subframe from a Triumph Scrambler, along with the seat and tail. 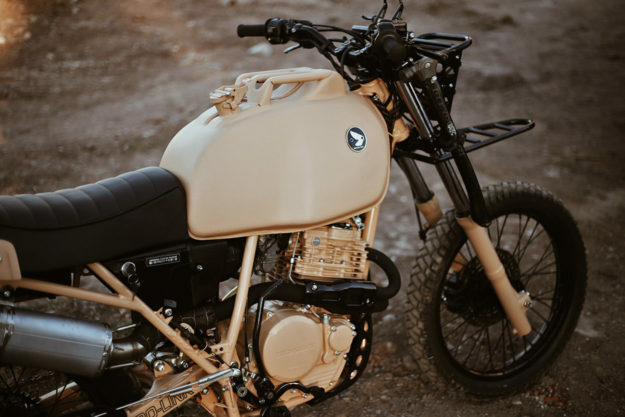 Then they worked on the details to complete the final look of the bike, adding front and rear carry racks and treating the tank, motor and chassis to sand-colored paint. 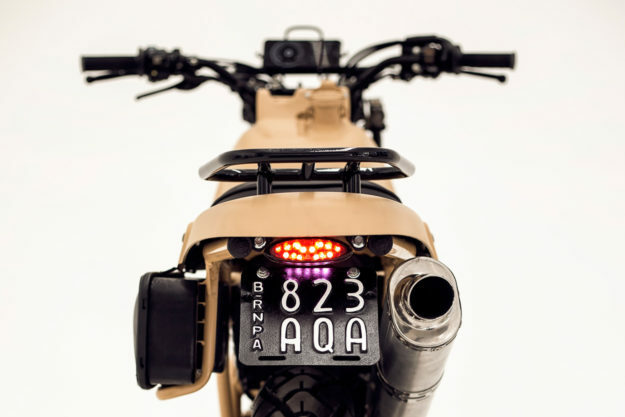 The black LED front lights set the tone for the build: three strips of LEDs installed in a custom mount. Right above is a sturdy mount for an iPhone running a speedo app. 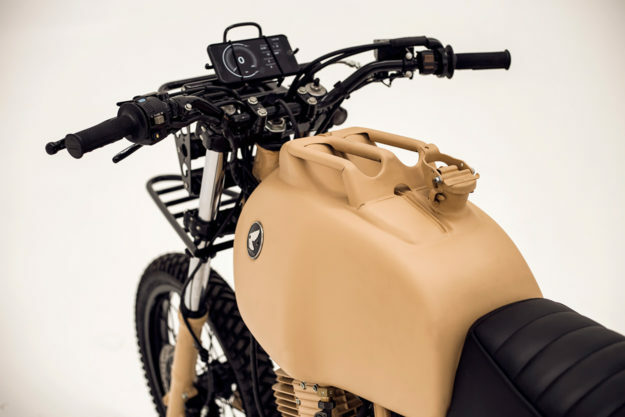 There’s also an ingenious touch to add a little luggage space: the ‘box’ alongside the seat on the left of the bike is a repurposed battery box from a Honda XR650L. These days, it’ll cost you just over $2,000 to get your hands on a solid XL600R in the States. 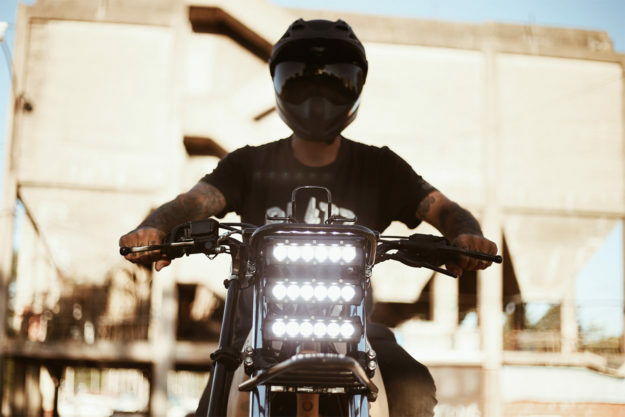 That’s about three times what you’ll pay for one of its contemporaries, such as the Yamaha XT600S or Kawasaki KL600. But it’s still a relative bargain for a tough dual sport with Honda engineering. That makes it the perfect custom donor bike. And with their tongues firmly in cheek, Herencia have shown what can be done without breaking the bank. 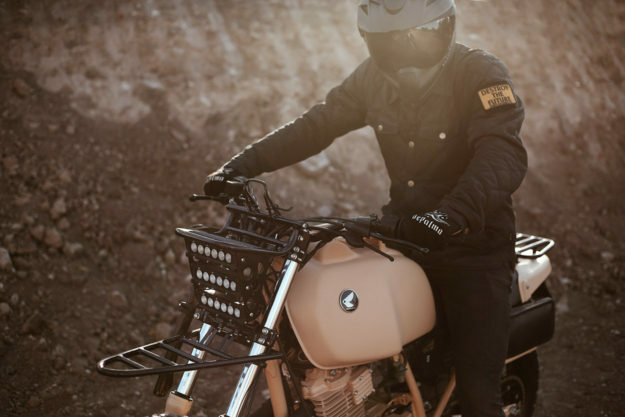 ‘Dirt Trooper’ certainly wouldn’t go down well at The Quail Gathering, but what the hell. We love the style.